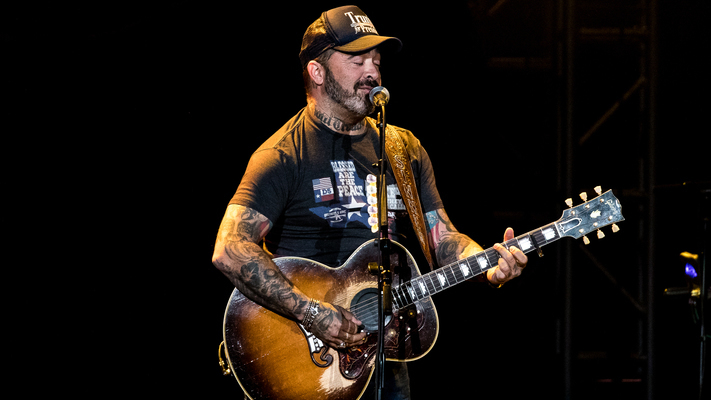 Aaron Lewis was born April 13, 1972 in Rutland, Vermont, and prior to launching his country career, Lewis entered music as the lead vocalist of the hard rock/post-grunge group Staind. Growing up in rural Vermont, however, Lewis spent his summers with his grandfather hunting and fishing, listening to Merle Haggard, Hank Williams and many of the great outlaw country artists. Prior to pursuing country music, Lewis’ band Staind had experienced a decade of popularity with successful tours and albums. But by 2011, Lewis was ready for a change and took a hiatus from his band to focus on a solo career, refashioning himself as a conservative country artist. He released his debut country EP Town Line that same year and followed it up with a full-length album, The Road, in 2012. The album produced several hits such as "Endless Summer," "Country Boy," and "Forever," and went on to be featured on Billboard's Country Chart, landing at No. 7. His next album, Sinner, was released fall of 2016 and debuted at No. 1 on the Billboard Country Albums chart, knocking Jason Aldean's They Don't Know out of the top spot. Sinner’s lead single, "That Ain't Country," was also a success, showcasing Lewis’ traditional country style and no nonsense lyrics.